Positive emotional mood in the full moon, helps to find a trip to the hairdresser and home cosmetic hair care rituals. The haircut made during this period, activates the further growth of hair and will fill them with vitality. People born on the full moon are characterized by independence and full relaxation in action. They know the price of both themselves and others. About these people say that they can not be fooled. Also they are characterized by high sensitivity, subtlety of feelings and the ability to empathize. Possessing an internal reference point. they will not go on provocation. Their bright feature is the ability to infect the optimism of others. Often, they are drawn to the knowledge and experience. The rational reasoning by which these people bribe others, they themselves can lead to a dead end. For effective implementation of the planned plans, it is important to take into account the phases of the moon. With a young moon, you must deal with those things that require a new, increasing energy. On the contrary, it is better to leave the cases related to the energy recession to the flawed Moon. This does not mean that life should completely depend on the lunar phases, but you can use the lunar rhythms with benefit. The full moon phase lasts three days, when all the activity of the biofield is concentrated in the aboveground part of the plants, and the roots lack energy. The life activity of plants is most intense in the full moon, they absorb much more water than usual, the seeds absorb more moisture from the soil. In flowers, fruits and stems of plants the greatest amount of energy is accumulated. At full moon the most succulent, useful fruits, but they are not suitable for storage. The viability and rooting of the roots during this period are significantly reduced. And aboveground parts of plants intensively develop. For example, a pumpkin grows very quickly, increasing by almost a centimeter per day. Acceptable types of work: - irrigation; - loosening; - hilling; - weeding; - thinning of seedlings; - additional fertilizing (mineral); - control of weeds and pests; - spraying; - mulching; - harvesting (not for storage and not collected in Water signs), especially "tops", seeds, medicinal plants; - Cut flowers. Not recommended: - landing (except potatoes); - transplantation; - reproduction by division of roots; - trimming; - pasynkovanie; - Pinched; - Inoculation and re-vaccination. The above-ground part of plants, active in the full moon period, when all the trace elements extracted by the roots enter the leaves, flowers, fruits, ie gather in the upper part of them. A child conceived in a full moon is extremely emotional, does not know how to restrain and control himself, is very internally mobile and impulsive. 1. What the weather is like on a full moon, this will be the second half. 2. If, during the full moon, a circle appears around the moon, there will be a bad weather by the end of the month. 3. During the full moon, a bright and clean month is good weather, dark and pale rain. In the full moon, it is better to eat plenty of fruit, drink juices or have a fast. These days our body is very susceptible, the body requires more food, therefore, this day can add extra pounds. Avoid full moon surgery. Statistics show that at this time complications and infections occur more often, the healing and healing process lasts longer, and close to the full moon often causes severe bleeding, which is difficult to stop. 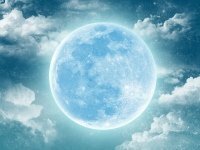 The Full Moon is not a very successful period for the conclusion of a family union, it is better in the growing phase of the Moon (preferably from 1 quarter to full moon, excluding the full moon itself). The peak of the influence of the moon, and hence of magical powers, falls on the full moon. This is the most mystical phase. If you saw a full moon in the sky - you know, it's time to hold the most powerful rituals. All the rites held on this day will have great power and the longest impact. The full moon power can be used three days before the full moon date and within three days after it. On the full moon, it's best to do your hair. During this period, information about your appearance persists for a long time, so if you want to dye your hair, you need to do it on the full moon day - the hair retains its color longer. Useful hair masks, the use of balms and creams. It should be noted that the full-bodied skin is prone to reddening and irritation, so do not actively engage in facial skin on this day. Do not forget that the full moon affects the psycho-emotional state of women - there are stresses, the level of anxiety increases. And stresses, as we know, lead to early aging and wrinkles. In order to protect yourself from the negative impact of the full moon, astrologers advise taking a warm relaxing bath with the addition of milk and chamomile during this period.